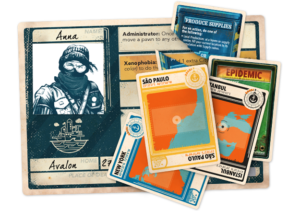 This article is a ‘first look’ at Pandemic Legacy Season 2. The information contained does not include any spoilers. 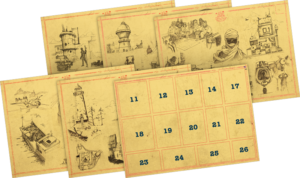 Everything discussed here can be found on first look inside the box and completion of a Prologue (practice) game and the initial setup of January. You can also see my review of Pandemic Legacy Season 1 here (contains spoilers). 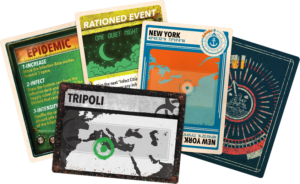 Pandemic Legacy Season 2 is a standalone game, however, the story does appear to be a continuation of Season 1, with direct references made to cOdA. On first look, it’s hard to imagine how the game of Pandemic can translate into this scenario. Most of the map is not yet available, only 9 cities are visible and new sea locations have been added. The surface of Pandemic Legacy holds no huge surprises. The new character cards give players the freedom of choosing their own artwork for the character, which I think is a great touch, but basic character traits, player cards and infection cards remain the same. Of course, to begin, only the known city cards are included in the player and infection deck, and there are multiple copies of each. Characters are allocated a job (each comes with its own special abilities) and players may also choose their character’s age and home (starting) location. Characters who begin their turn in an infected city gain exposure. The exposure track is hidden under scratch boxes. Each box could contain no effect, a scar for that character (a handicap chosen from available scars and added to that character), or death. It is unknown at this point if each character card’s track is the same, or if luck of the draw could mean death may come sooner for some than others. Here’s where things seem to work in reverse to basic Pandemic or Season 1. Players work together to place supply cubes in uncovered cities. These supply cubes serve to ‘protect’ cities from infection. Each game begins with a base number of supply cubes to allocate, and players can ‘produce’ further supplies to replace cubes that are removed by the infection deck. The infection deck works as normal, except when cities are drawn which have supply cubes in place, a cube is removed, placing that city closer to the risk of infection. If a city is infected and has no supply cubes in place, a plague cube is placed on that city. Plague cubes cannot be removed once placed. At least, not at the start of the game. Every plague cube placed means the incident track is increased by one. Allow eight incidents to occur and it’s game over, so it’s in your best interests to keep city supplies in place and reduce the risk of infection. Unfortunately, you can tell from the start that this won’t be easy. You know right away that your starting number of supply cubes is reduced each month (zero starter cubes for December!) AND as you work to uncover more of the map you will increase the number of cities that require your protection. Epidemic cards also work in reverse. The infect stage has you remove all supply cubes (if any) from the city drawn from the bottom of the deck (as opposed to placing three disease cubes), making your city ripe for an infection outbreak. If a city with three plague cubes is infected, a chain reaction occurs, and your incident track will start to increase uncomfortably quick. More sections of the map can be revealed by exploring that area. In order to ‘recon’ you need to collect city cards of a specific colour, and in some cases, these must be unique (one copy of each city only). Considering you can’t work towards a cure right now, you might think that these cards are in good supply, but that would be wrong. To begin, your main, mandatory objective is to build three Supply Centers. To do this, you must discard five cards matching your current city’s colour. As this is a mandatory objective, you’ll need to be careful about which cards you use for other purposes. Supply Centers allow you to produce supply cubes in bulk, and the number of cubes produced is dependent on the population of the city the Supply Center is based in. The population can increase or decrease throughout the game (increased through end-game rewards or decreased if the city is infected) and as producing supplies is your only line of defence against infection, increasing, or even protecting population would be beneficial. Much of Pandemic Legacy Season 2 is similar, but not the same as Season 1 or the base Pandemic game. Despite this, I would definitely take advantage of playing a Prologue game before beginning your campaign to get used to the new rules. The Prologue game can be played as many times as you like, and the only difference is that you play with only the main mandatory objective and you cannot do the recon action (explore and reveal new areas of the map). Don’t forget to take advantage of free actions!